Once you have those ideas flowing, here is a great resource to help students understand how a story is put together. Story structure is presented using a visual and physical cue - a story box, with the sides of a cube representing beginning ; middle ; end. 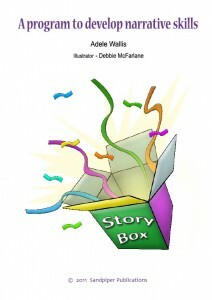 The story box cue is also used for other structural components such as sentence connectors, vocabulary choices, top level structure, and question prompts. Sequencing pictures are also provided which show four pictures, which can be loosely sequenced as the four episodes of a story. In this revised edition, there are now also two problem pictures for each sequencing set, to provide additional stimulation towards more complex stories. The pack comes with a set of cube nets with the story prompts written on each side and thirty story starters that range from daily living activities (such as getting ready for bed) to fantasy themes (such as a moon landing and meeting aliens).